There is a big debate happening among some of us concerning the vesture for the Liturgy of the Passion on Good Friday. On one side the camp, there is the argument that ALL priests in attendance should vest in chasuble, as if for Mass. I am in the camp that argues that there is no need for that, since there is precisely NO Mass. Hence, the “celebrant” only needs to vest while the others can be as in choro. I see that the Liturgy at the Vatican uses this model; while the liturgy at Westminster Cathedral preferred the former…. What say you? It isn’t Mass. There can’t be concelebrants in the same sense. There seems to be no reason for anyone other than the sacred ministers immediately concerned with the ceremonies to be in sacred vestments. Let all others be in choir dress. This entry was posted in "How To..." - Practical Notes, ASK FATHER Question Box and tagged concelebration, Goo Friday, vestments. Bookmark the permalink. ” On one side the camp, there is the argument that ALL priests in attendance should vest in chasuble, as if for Mass”. But, for Mass, must all priests in attendance vest in chasuble? I tought only the celebrant, or the concelebrants, were to vest in chasuble. Perhaps this “side of the camp” is the same side of the camp that holds to the absurd proposition that all priests in attendance at Mass must always concelebrate, that they cannot without offense refuse concelebration ever, a line of tought that results in the actual reduction in the number of offerings of the Holy and propitiatory Sacrifice of the Mass. As for the “Liturgy of the Presanctified Gifts” on Good Friday, let the example of the Court of Rome be for the Latin Church the norm: only the officiating sacred ministers wear sacred vestments, and all other priests, even if they be bishops or even cardinals, attend in choir. When in doubt, the Roman Rite must do things as they are done in Rome by the papal court; that has always been the norm. So there is no question of other priests wearing chasubles for the Good Friday liturgy. And, as pointed out by Father Z already, there is on Good Friday no concelebration, there is no celebration proper, no offering of the Mass. So comparison with concelebrated Masses, or with any Eucharistic celebrations, is not possible. Concelebration is characterized by the joint performance of the Consecration, and in the Liturgy of the Passion there is no Consecration. So the very elements that would characterize a concelebrated liturgy are not possible in the Solemn liturgical action of the Lord’s Passion. I’ve never seen concelebrating priests in person wearing a chasuble always just a stole(normally the ugliest imaginable) over the Velcro moomoo alb. Are they supposed to be in a chasuble for regular concelebration? Thank God for SP. The concelebrants must wear a chusable if there are ones available. My first pastor when I was a new priest rightly insisted that there was no such thing as concelebration at the liturgy of Good Friday, and so sat in the pews with the people while I led the service. It’s a good example of how in many places we have lost a sense of clergy in choir. I would agree firmly with Fr Z on this matter. The example to be taken is this: Bishops, even the Pope, as celebrant on Good Friday, do not on this day wear the pontifical dalmatic, the symbol of their full ministry in the 3 Orders of bishop, priest and deacon; they wear only the vestment proper to their function on the day, the priestly vestment, the chasuble. It follows that those not presiding as celebrant, that is, those in attendance, will also not wear a vestment which is symbolic of their office, but wear only that which pertains to their actual function in the liturgy (thus the deacons functioning as such wear the dalmatic). For this reason, in the 1955 (’62) form of this Rite, the ministers come in vested only in the stole, and the celebrant does not assume the chasuble until the the rite of communion. I think it would certanly be odd to have all the priests wear chasubles. We had the celebrant in a chasuble, two deacons in dalmatics, and the rest in choir dress, with red stoles. Priests in my diocese all have matching chasubles… if a concelebration ever occurs with the bishop, the bishop’s chasuble is more ornate, albeit matching. It helps to differentiate. I had actually only seen on concelebration with the non-principal celebrant wearings just stoles… it was weird and unsightly. Especially with the the types of albs worn today… weird looking!!! At our Good Friday Service, our pastor took the “this is not a Mass” to the extreme. Any time there is a non-Mass service the priests become assistants and the service is lead by the deacon. In this case the deacon was in red and did all the “celebrant” readings / prayers, while the two priest simple wore their red stoles and did precious little. It is interesting that this should come up. Just today this picture (http://4.bp.blogspot.com/-WMfDJysmZ3I/TbpxDPgj_wI/AAAAAAAAFsY/dKjOOgZqlj8/s1600/WestminsterOstern2011-7.jpg) was posted on NLM blog. 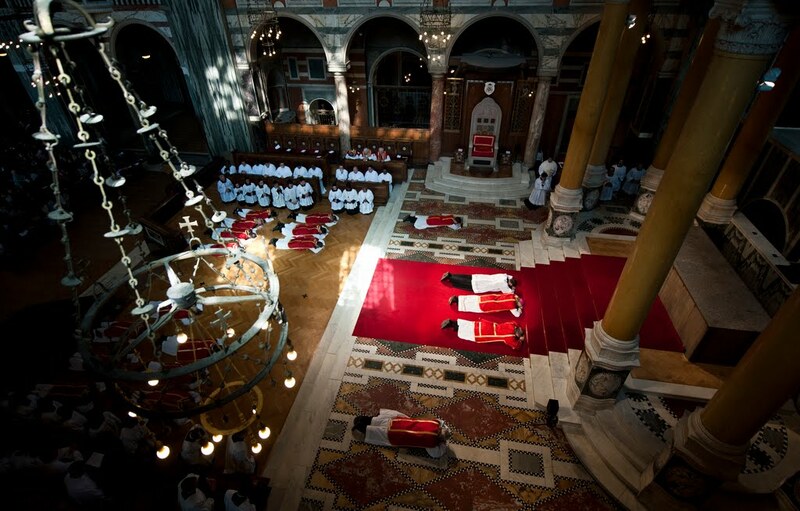 It is the prostration before the altar at the very beginning of the liturgy of Good Friday at the Westminster Cathedral. If you look behind the priest, deacon, and MC you can see many priests in Roman cut chasubles. It appears from what I have seen at Westminster that most things are liturgically sound. I wonder what their reasoning is for the chasubles. This debate is obviously less straight forward than the comments have made it out to be. Father Z, what do you think of this? It would seem the ideal would be for priests to attend in choir; that is in cassock, surplice, and to wear a stole at the time for communion. It would seem that in the reality of things priests arrive not in cassock but in regular clerics / clerical suit. And therefore, it would seem preferable that they be in alb and stole. I was one of the priests vesting at Westminster Cathedral and of the 14 or so priests there for Good Friday, close to half were not in cassock/habit. It seems that wearing alb with stole (and in this case, chasuble) was preferred to having half the priests in albs and half of them in cassock and surplice. Of course, these are just observations and no official text has been cited. Our pastor wore an open sort of red garment, I don’t know what is called but it was almost full length, and had sort of gold ties at the front. It was very beautiful, sort of like a cape but I think it had sleeves. It was different than what the priests usually wear for mass. The deacon wore what they normally wear, the rest of our priests were still hearing confessions during the Good Friday service so it was just those two. @Varda It sounds like you pastor wore a “cope” which is indeed a cape-like vestment. It is typically worn by clergy in a liturgical setting which is not a Mass. While the service on Good Friday is not a Mass, the cope should not be worn by the priest because the rubrics call for “red Mass vestments” in this particular instance. It’s very clear and there’s nothing dubious about it! There is no concelebration at The Mass of the Presanctified or whateverthehell we’re calling it these days. Therefore, ONE chasuble, that’s it. While we’re at it… In the Latin Rite, if there are more than three deacons for a pontifical, then everyone else in choir attire. The unfortunate thing is that the Bishops’ conference has not decided what choir attire for deacons not advancing to priesthood is. (THERE’S NO SUCH THING AS PERMANENT OR TRANSITIONAL DEACONS….just DEACONS) I don’t see any reason why such deacons can’t wear cassock and surplice and attend in choro. Even in dioceses where deacons aren’t permitted to wear clerics, there’s no reason they shouldn’t be allowed to don cassock, collar, surplice, and stole over the left arm. Mike, thank you for the info on what the vestment is called. Yes, I know I am lucky in my parish all the priests including the pastor try very hard to do everything they can to make confessions available to us. We had many hours available during Holy Week and also every weekend we have about three hours -2 on saturday and 1 on Sunday with more than one priest available. We had the celebrant in a red chasuble, two assistant priests in albs with red stoles to read the “narrator” and “other persons” parts of the passion. One of the assistants brought in the crucifix for the “Ecce Lignum” (the cross was then held by the celebrant for veneration). The other assistant went out to bring in the Eucharist at the appropriate moment. The three divided the General Intentions — one assistant sang the invitation to pray, the second assistant took the deacon’s lines (Flectamus genua — Levate), the celebrant said the prayer for each intention.